Black n Red A4 20 Pocket Display Book 400050725 Pack of 1 Stylish and professional display book from the executive Black n' Red range. Elasticated closure for security. Business card holder on front. Guildhall Display Book 24-Pocket A3 Landscape GDB24/L Pack of 1 Goldline A3 Display Book. Manufactured from heavy grained Black PVC, designed to look good and last. Features include a useful card holder on the front cover. Landscape format with 24 top opening pockets, ideal for sales literature, presentations etc. 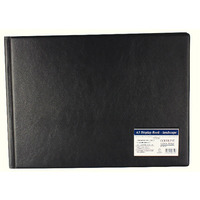 Guildhall Black Display Book 24 Pockets A3 Portrait GDB24/P Pack of 1 Goldline A3 Display Book. Manufactured from heavy grained Black PVC, designed to look good and last. Features include a useful card holder on the front cover. 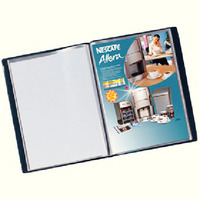 Portrait format with 24 top opening pockets, ideal for sales literature, presentations etc.